Users may often think about the question of “how to merge partitions and unallocated space into one?”. I will give an answer to this question for users in this paper. “partition merging” means that you can merge partitions with small size into one with large size in order to change partition size. If there are too many small partitions in one disk, you can choose to merge all partitions into one to manage our disk better. Of course, users can merge partitions with Disk Management. And achieving this needs several steps. 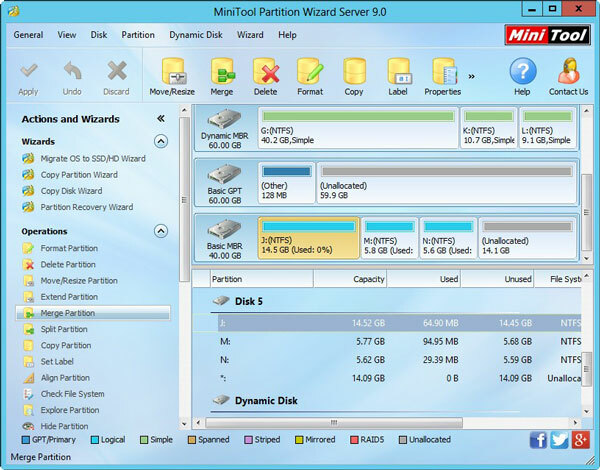 Users can also choose to use partition magic – MiniTool Partition Wizard to achieve this. In this post, I will teach you how to merge all partitions into one with these two methods respectively. How to Merge Partitions and Unallocated Space into One? In Disk Management, you can’t directly merge partitions together into one, but you can delete partitions first to release unallocated space. And then merge the certain remained partition with this unallocated space. Right click “My Computer“, choose “Manage” to enter the main interface of “Computer Management” and then select “Disk Management” to get disk list. You can see that in disk 3 (the target disk), there are three small partitions and a piece of unallocated space on it. Here you can merge all partitions and unallocated space with Disk Management by deleting partitions J: and O: respectively. Therefore, right click partition J: and choose “Delete Volume” to release unallocated space (then, you will also delete partition O: with the same method). After the certain two partitions were deleted in the order in step 2, there will exist only one partition and a piece of unallocated space. And you should right-click the partition and choose “Extend Volume” to merge this partition with unallocated space. After reading the above way of using DM to merge all partitions and unallocated space, if users don’t want to merge several partitions together by deleting partitions, they may choose the second way to merge all partitions into one by using partition magic. I will show users the steps of merging partition with partition software. After running MiniTool Partition Wizard, users can see that there are three small partitions, namely partition J:, partition M: and partition N: and unallocated space in the target disk. Users can choose to merge partition J: and M: first. So, they can choose partition J: as source partition (and the merged new partition will succeed the drive letter of it) and click “Merge Partition” from the left action panel. Note: MiniTool Partition Wizard Free Edition doesn’t support “Merge Partition” function. Users should choose another edition to achieve this. Then, users should click “Next” to enter the next step. Choose the adjacent partition M: and click “Finish” to go back to the main interface. Click “Apply” and choose “Yes”. After successfully merging partition J: and M:, we need to merge new partition J: with partition N: with the same method as the above content. After we finished merging partition J: with partition N:, there will remain one partition and unallocated space on the target disk. To merge all partitions and unallocated space into one, we need to add this unallocated space to the remaining partition J:. Choose partition J: and click “Extend Partition” from the left action panel. In the pop-up small window, users need to drag the sliding button to the rightmost side in order to take all unallocated space. Then, users should click “OK” to go back to the main interface of this partition magic. When users finish reading this article, they may know how to merge all partitions and unallocated space into one. If you need any help feel free to ask in the comments section. I hope you will like this article and it will help you to merge partitions of your hard drive into one.